The dell sonicwall tz series of next- generation firewalls (ngfw) is ideally suited for any organization that requires enterprise-grade network protection. sonicwall tz series firewalls provide broad protection from compromise by combining advanced security services consisting of on-box and cloud- based anti-malware, anti-spyware, intrusion prevention system (ips), and content/url filtering. to counter the trend of encrypted attacks, the new sonicwall tz series has the ability and processing power to inspect ssl connections against the latest threats, providing an even higher level of security. backed by the dell sonicwall global response intelligent defense (grid) network, the sonicwall tz series delivers continuous updates to maintain a strong network defense from cybercriminals. with full deep packet inspection operating at performance levels that match broadband connection speeds, the sonicwall tz series is able to scan every byte of every packet on all ports and protocols with almost zero latency. this eliminates bottlenecks and allows organizations to use security as an enabler, not an inhibitor. the sonicwall tz series also features an integrated wireless access controller, 1-gigabit ethernet ports, and native vpn remote access clients for apple ios, google android, windows, mac os and linux for fast, secure mobileaccess. the dell sonicwall global management system (gms) enables deployment and management of sonicwall tz series firewalls from a single system at the central office. the products include fully tested routing features for ipv4 and ipv6, including route-based vpn protocols ospf and rip v1/v2. authentication protocols support includes ldap and radius as well as single sign-on capability that can integrate with active directory. 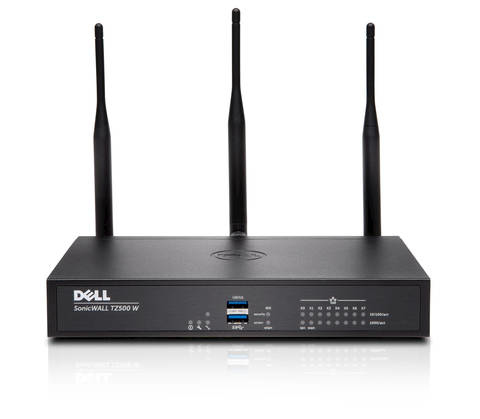 all dell sonicwall firewalls provide advanced threat protection from botnets, and udp and icmp flooding.